After a long and exhausting ride, I finally reached Legazpi City. I was excited to check in at Casablanca Suites to relax a bit before engaging myself into another fun adventure in the Bicol region. I took a tricycle from the the bus terminal going to the hotel and after less than 10 minutes I’m already standing at the lobby. I arrived before check in time and they were still able to accommodate me. The hotel lobby was spacious, well-lighted and elegant. I checked-in, went to my room and enjoyed a relaxing experience at Casablanca Suites. Casablanca Suites has 19 spacious rooms which are crafted to suit the convenience of a business and leisure traveler. 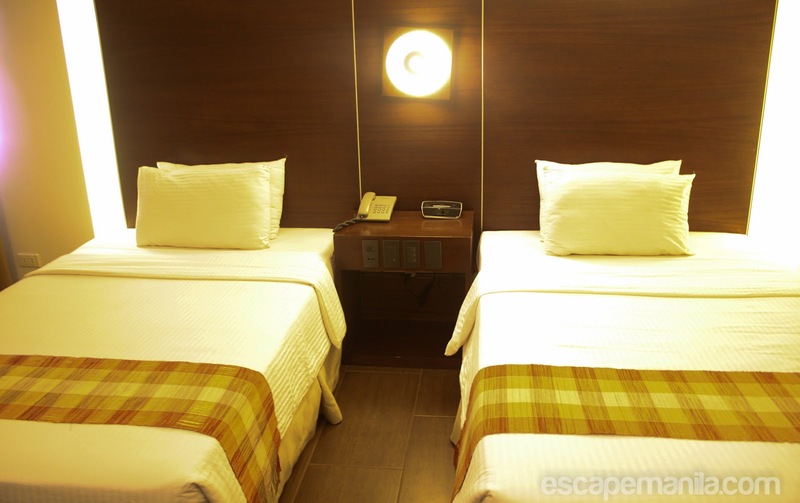 Their air-conditioned rooms are equipped with 32″ TV entertainment system, a working desk, a compimentary WIFI and LAN internet access and other amenities that will make your stay more comfortable and enjoyable. The hotel offers complimentary Filipino and continental breakfast buffet. The restaurant is located on the ground floor and it offers a great view of the majestic Mount Mayon that will greet you a good morning. I really enjoyed sipping my hot coffee and eating my favorite Filipino breakfast while staring at the Mayon Volcano. 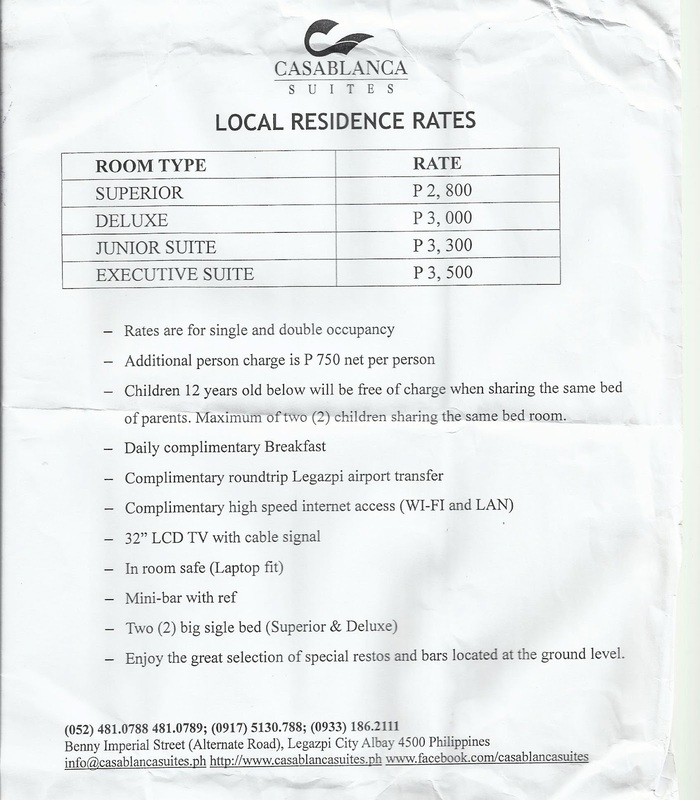 Rates: Reasonable price considering the amenities and services they offered. Rooms: Spacious, chic and modern. Big and clean toilet and bathroom. Restaurant: Comfortable seats that offer a great view of the Mayon Volcano. Lobby: Clean and comfortable with 2 computers available for guests who want to get connected to the internet. If you want to have a great view, request for a room that faces the Mayon Volcano. It will be a little more expensive but it’s worth it. There are small coffee shops and restaurants outside the hotel (same building) should you want to try some Bicol delicacies. You can take a tricycle in front of the hotel that can bring you to the city center and from there you can take a jeep going to Legazpi’s attractions. Embarcadero is also just one ride away if you want to hang out at night or go shopping. 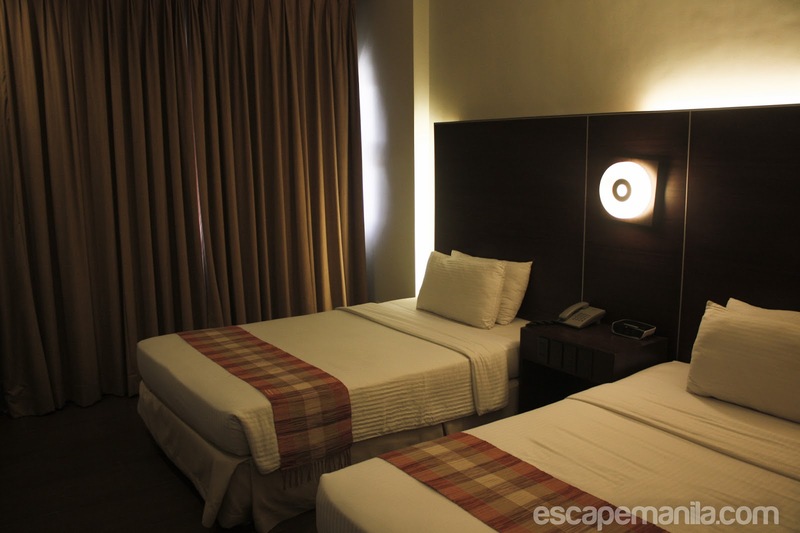 *Casablanca Suites is a sponsor of Escape Manila’s PHL50 : Backpacking the Philippines in 50 Days.